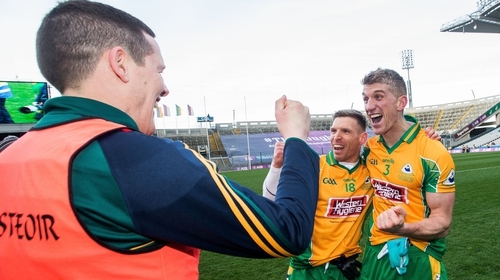 Corofin manager Kevin O'Brien hailed the dedication of veterans Gary Sice and Kieran Fitzgerald after his side completed back-to-back All-Ireland SFC club triumphs. Sice top-scored in the 12-point win over Dr Crokes with 1-05 (3f) while Fitzgerald made a crucial goal-line block before being dismissed for two yellow cards late on. "Professionals playing an amateur sport," said O'Brien. "They do it week-in week-out. Fitzy and Sicey are outstanding in the way they do things and they are great leaders. "It makes my job easy when you have lads (aged) 34 (Sice) and 38 (Fitzgerald). For young lads there are no excuses, you have just got to do it. These lads eat the right thing all the time, they go to the gym they do their yoga, they are a credit. "We played with great commitment today, we challenged very very hard for the ball. We threw our bodies on the line, and that’s excellent from a team that won an All-Ireland 12 months ago. They’re a great bunch and I’m absolutely delighted for them." Corofin almost didn't make it out of Galway this year - they needed a late point from Micheál Lundy to force a replay against Mountbellew/Moylough in October - and O'Brien admitted that that second chance in the county final was the catalyst for a season that ended in a third All-Ireland crown in five years. "We got a rude awakening that day and were probably lucky to get away with it," he admitted. "But then we played well in Connacht semi-final and I just think that you’ll always get an off day when you’re so long on the road. "The last few years in Galway you play a lot of the teams, particularly the way the format is now at the same time. Once you get out of your own county, you’re Galway champions and you get a new lease of life going into Connacht and the All-Ireland. "Once you’re Connacht champions you’re only one game away from Croke Park and two away from winning it. It’s a different lease of life. The shackles come off a small bit."